If you’re wondering why WordPress is still the most popular content management system across the globe, the number of premium WordPress themes will give you an answer. The absolute strength of WordPress is its unlimited number of developers and amazing WordPress business themes available. Everyone loves a drag and drop theme and this one is great! It has 6 modules you can drop into your homepage alone. They include the slider, tagline, video, highlights, recent work and static page. You can easily move them around with a drag-and-drop function as well as disable the modules you don’t wish to use. You do not have to hire a web designer to create a professional looking site as Powered is just easy to customize. For those who want their WordPress site it looks absolutely unique, the unlimited number of colors on Powered header will be sheer joy. You can also change the background to anything you want and achieve custom visual appeal. The other feature that appealed to me was the fact that this theme comes with loads of page templates like the normal blog, full-width page, full-width centered, photo gallery, portfolio, portfolio with filter, services, sitemap, staff and staff by department. There is definitely a great collection of basic templates and incredible business tools to make keyword WordPress site highly business optimized and this is why Powered is a great theme. If you’re looking forward to building a website where you can just share your product portfolio or similar items, Kraken can work wonders for you. 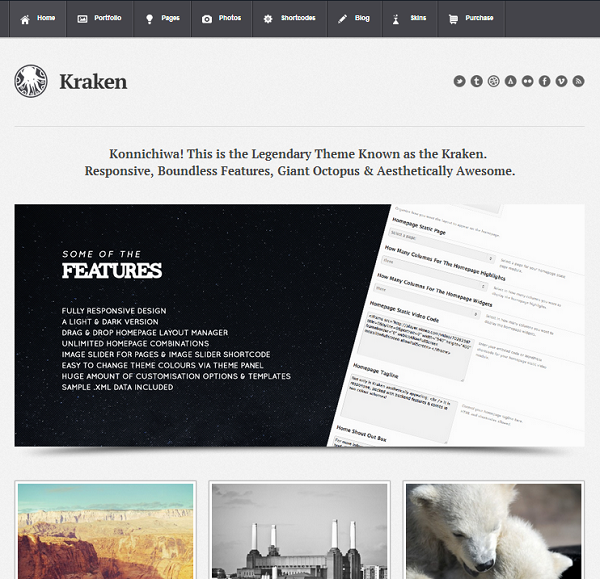 With unlimited color mode you’ll find exceptional simplicity, Kraken does an awesome job by providing an engaging visual appeal to your online portfolio and this is a very good theme for those who want to sell their products or services online. It also boasts unlimited homepage combinations with customizable modules and the amazing built in shortcodes. For example you can add an image slider to any page by simply adding a shortcode. This theme includes everything that a business theme should, social bookmarking links, responsive pricing tables, awesome graphics displays, and so much more. 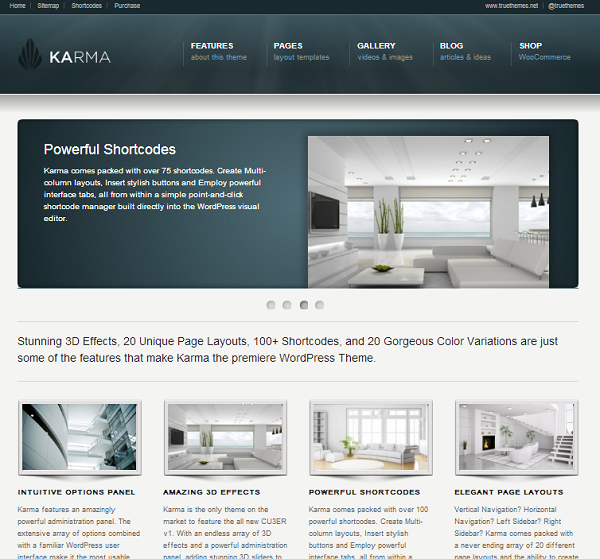 Karma is probably one of the most popular WordPress themes out there. It has unlimited features and awesome potential for customization. It’s customizable to such an extent that you will lose focus after one point of time! However, the team offers numerous features such as search engine optimization tools and logo builder, making your website creation and easy task. You can find several 3-D sliders and pricing tabs along with decent customization potential. 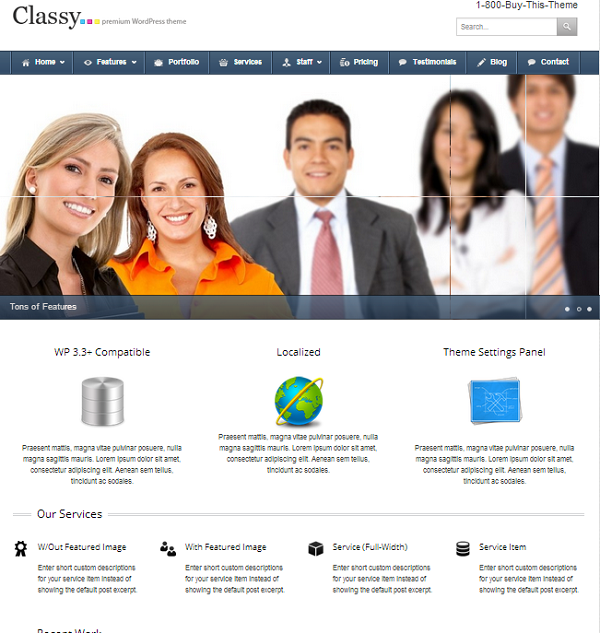 This 100% responsive theme has a gorgeous design that would catch any customers eye and hopefully entice them to buy. Karma is also known for offering excellent customer support to its users and that is a big PLUS! Unite comes with five skins but this is probably one of the best looking butever created. The textile and combat ability and an amazing portfolio display feature, Unite is the best theme for artists to showcase their work. 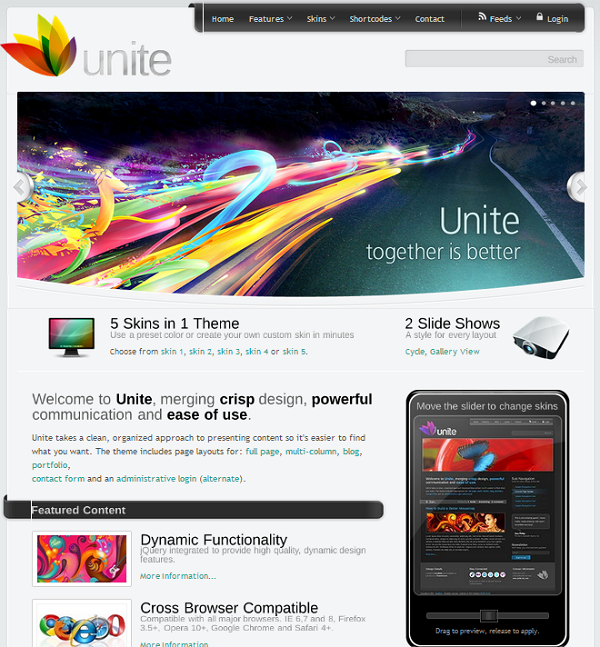 If you’re adamant that your website should match with your artistic skills, make no mistake; Unite is the right WordPress theme for you. Classy comes with more than 20 navigation icons and offers support to the latest WordPress. It has the pitch slider feature and an amazing design that makes it suitable for any business website. I think the main attraction to this theme is that it is very simple yet elegant, just like the minimalist WordPress themes I also recommend now days. This is an absolutely fantastic theme – not only does it look fantastic, it functions flawlessly and the documentation is so comprehensive it’s unbelievable! These are 5 top premium WordPress themes for business and they will no doubt boost your brand name and make your business look professional, no matter how large or small it is. Wonderful post for business man. and i am impressed with your post.These Premium WordPress Themes are so energetic and i hope these word press themes will help me in my business. i must say thanks for this post and keep it up. 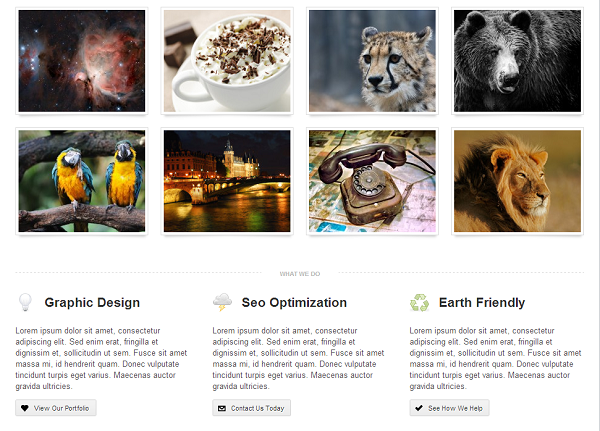 It was a great collection of highly potential themes perfect for business use. We know the power of internet nowadays and how it affects the business marketing, that’s why it’s crucial to choose the best theme with user-friendly interface to attract more audience. Thanks for sharing your list! ya absolutely right ,choosing a appropriate theme is very important for any online business.All these theme you shared are really good.Thanks for sharing them. Ya Mitz…getting bored by one theme change another nice option..Wordpress doing very good job for those who dont know much abt designing a website by providing a collection of themes…really Mitz these prof.theme are givin much more…thanks for the options u provide..Nice post. There are lots of controversial points of view as for the WordPress for Business sites! I definitely agree that WordPress for business is simply rocks! Amazing themes. Really Fantastic. Thanks for sharing with us! The most basic and tidy task of any blogger is to select an appropriate theme for his blog. I too spended around 5 days to finalize my theme. Amazing themes, Milica. Very professional and authentic. If every blog was based on themes like those, what a world would it be ;)Thanks for the great list ! Marco recently posted..Insane Dimitrij Ovtcharov Training ! however, i have never used any of them till now. But shall try a few of them if ever got the chance for sure. Oh..! I am in love with these themes. I wish I have enough budget to buy them. But one day I will for sure. Those were some lovely themes. I personally do like the karma theme. It’ll suit perfectly for any business website. Emmanuel recently posted..Banned from Adsense, what’s next? Wow, amazing list of wordpress business theme and i like the karma theme mostly in the about listed ones. Nice wordpress themes mentioned by you and that’s why I love wordpress because it gives cahnce to work on different number of themes and many other features. All the themes above are seems great but I really like the unite theme. But of course word press is everything – I can never think of any other CMS. The flashy themes and icons suits me just fine.